DBK: Great thread and info here. Makes me much more excited to get a TextBlade! I somehow had missed this thread completely on my earlier perusal of the forums (before I was able to actually log in - I had a problem that prevented that, for MONTHS!). Waytools - I agree with Cameron - THAT. IS. SO. COOL. The problems were, on Dvorak using normal numbers, the comma is on the qwerty W key. So to access numbers that way, I had to keep releasing the green layer to get the comma. But the way I had set up the number pad and using it locked, the numbers were on the main layer but to get the comma I had to switch to green. So I found it better to move the equal sign to the right pinky (where I had put the question mark) and put the comma on the main num pad layer where I had put the equal sign before. One of the hard things when customizing is deciding how to best group things logically! You sound a LOT like me on how you do things. 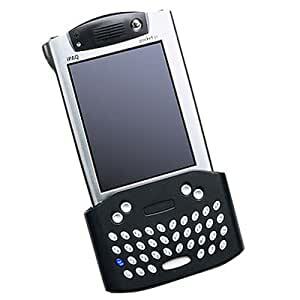 AGES ago, in a time probably none of you know, there was a Compaq iPaq PDA. I got one free at work to test for work use, and they bought all kinds of cool accessories, including a little “snap on” keyboard that went on the end of the iPaq. This isn’t the particular snap on keyboard I had, but you get the idea - you had the device itself, then you’d slide this keyboard thingy on the end of it. But the keyboard had HORRIBLE compromises. At the time, I was running Linux on my Compaq iPaq, and writing code on it every day, so I needed the full breadth of programming characters available. The device was presented to the OS as a hardware keyboard, and had a driver, but I didn’t know yet how to filter the keys properly system wide. In other words, I could adjust them one way at the command prompt, but then I’d have to adjust differently in Xwindow for X apps, etc. So I decided to remap the keys in the driver itself. It was the wrong solution to be sure, but it worked to QUICKLY give me all the configurability I wanted and it worked system wide. I had to make EXACTLY the kinds of decisions you are talking about. Ok, so I need the be able to type a vertical bar “|”, but I don’t want to have to hold three keys down to do it. I’ll give up the quick access to the ` character because I personally don’t type that one very often (just when I’m writing shell scripts that want to run a command and return the output). Stuff like that. I look forward to one day having to make those decisions with my TextBlade. What program do you use to create your keyboard layout diagrams? They seem like they are really useful in learning each layout. I just use Pages on the Mac. This is my latest Mac version (Dvorak layout and using the Emoji hot corner option. I made another change to the Numpad layer, putting the math keys and period and comma also on the left side (mirror image) because this lets me avoid the green layer if I'm using both hands instead of one. And I wasn't using those spots anyway. A lot of my Emoji layer is designed for one handed operations on the right side - volume control, screen brightness, paste, undo, redo, etc. Actually, some of these things I do so rarely I can't remember which keys to use - but that's where the chart comes in handy! I’m headed out to play catch with my kids right now and will be playing two softball games tonight in our local league, so it will be a bit before I can respond. I HAVE MANY QUESTIONS ON THIS!!!! I have questions about it too! Have you any idea how hard it is to find icons that are clear in their meaning? In some cases, I can't even imagine what some could be. I do like my "solution" for "find", "find previous", "find next". I just use the traditional magnifying glass and change the tilt to fit (vertical, tilt left, tilt right). I also think good uses of arrows can be handy, even if I may not be sure what the basic icon should look like. Things like moving forward or back by word (or paragraph, page, etc). Figure out the basic icon and and an arrow under it for direction. I wish I was a graphics artist and could create these things. Some of the icons I adopted in my charts are not ideal. And some I use so seldom, I'd have to look the keys up in the TB app to remind myself what they actually do! I’ve got a background in graphic design. I’m actually truthfully not any good at starting from scratch but any good base template and I’m good to go. I'll have to get some time to go through many of the existing icons, but you can look at what I have on my chart to get an idea. Some of those are actually fine, but they are often not nice and sharp (necessary when they also have to be so small). An example is the icons I use for copying the screen or a window and then there is the option of copying to the clipboard or desktop. I figure I can just put "C" or "D" in the icon to relate to clipboard or desktop, but I need nicer basic icons, separating the whole screen or just a window. What I have now (see the emoji level), is a heavy dotted outline. Basically that works, but the dotted line needs to be black (all should be black pretty much - unfortunately, many of the icons I found were more gray or something) and it needs to be THIN. I don't know how to differentiate a screen from a window icon though. Of course, the C and D need to be part of the icon and centered (right now they are text typed under the icon so not quite centered). I guess I could go "avant garde" and make the dotted lines for a screen copy actually be little curves (sort of S shaped) and sharp angles that could be interpreted as W's! On the bottom right of the App layer, I found pictures of windows so I put a plus sign in one for "open new window" and arrows for next or previous window. There are all kinds of consistency issues on sizes as well so, while functional, it sure looks messy! I think @WayTools should come up with a complete set of default icons, maybe in various styles - but one set specifically for fitting in a small space! And then have people submit their own ideas which, sometimes, may replace their defaults. Ok, so I’m currently holding a nine month old baby, I’m not gonna be able to do my normal reference to old posts while writing this. So bear with me - I’m writing in between playing catch with my kids and leaving in an hour and a half to go play softball. Ok, so I’ve looked a bit on the wiki someone made (don’t have the link handy right now, but thanks for putting it together) as well as reading all this stuff here on the forums. I’ve also watched a bunch of videos (there are surprisingly few out there and pretty much NONE with what I really wanted to see). I get that there are keys you can map, but what liberty do you have? For example, I get that you can order a TextBlade with different layouts, but is this truly JUST about the printing on the keycaps themselves (and presumably default mapping in the firmware), or are some of the keys hard coded to the layout you pick? In other words, are ALL keys re-assignable or only some? The chording is very confusing to me right now primarily because I’ve yet to find it all layed out anywhere. Again, I don’t have it right in front of me but I seem to remember each adjacent pair of keys as you go across the keyboard map to the various jumps. Then there are (I think?) chords to get to other ... modes. And also “buttons” on the space blade to access things (I only recently understood that bit). Can someone either point me to or write up how this all works? I want to know how EVERY SINGLE THING is accessed on the TextBlade - all the mechanics of it. I’d LOVE a video of someone going through all of this. Obviously I get there are NDAs - I’m NOT requesting anyone to violate them, I just want as much info as I’m allowed to get. What I’d LOVE is a way to practice all the typing the TextBlade allows before general release even happens. But the links I found to ways of doing that are for versions of OSX that are older than I run and I don’t want to revert to an ancient release. And the tool he was using doesn’t run on modern OSX apparently. Anyone know of a CURRENT way to practice typing like the TextBlade, today? I can work on this with you this weekend I think. I bought a BUNCH of icons from a professional design house for an app I wrote for iOS 7. I’ve got all the vector artwork for them all so they scale arbitrarily to any size. I likely won’t have the best solution to begin with but we should be able to rapidly iterate together to get something good. You can order different layouts on the hardware - though we have no idea how much that may delay an order. But the customization we talk about is the characters you program onto each layer. For an extreme example, I use Dvorak. Well, that is one of the many standard layouts they offer so no problem. But as I used the TB, I also used the "hot corners" setting. This puts, on a Mac, Command on the left corner of the space bar and Alt on the right. This is in addition to the normal chord approaches for those keys. Well, I found I was pretty much never using alt - and if I really needed it, I could always use the chords. I decided I wanted another layer mostly to do some things one handed. I had been using the function layer (holding a 2-key chord and whatever other key you programmed) for this. But for one hand, you were pretty much limited to the right hand. That gave limited options since two of those keys were the chord for functions! So I switched to the emoji layout even though I rarely use emoji. This layout changes the Alt halt corner to be the emoji layer. Now I could reach any key on the right while holding that hot corner (some easier than others, of course). But the emoji keyboard comes only as qwerty. So I had to customize that qwerty layout to be Dvorak. So a LOT of changes. But at least it could be done. I wouldn't be surprised if later we got versions for Dvorak as part of the standard set. A number of testers, especially in the beginning, had trouble when wanting "p", but hitting delete. So some opted to remove delete from the main layer and just use the green layer for that. Likewise some folks had trouble with hitting Enter instead of the apostrophe. In many places, this would send a message you were typing before you were done. I tried some of these changes, but just didn't like them. Others do. I found just changing some boundaries worked best for me. Almost all keys are customizable. I think, on most layers, you can't change Shift, for example. And you can't program the hot corners beyond what they allow (you either have Command and Alt or Command an emoji), but I think they plan on opening that up. This has been a process. Originally there were more places, at least on some layers, that we couldn't change. Almost no limits now. Jumps are easy. You have 6 and you get them by hitting two adjacent keycaps across the top. So, QW, WE, ER on the left and similar on the right - there are only 6 possible combinations since the keys you use must be on different keycaps. You can't do RT because they are on the same keycap. I try to set mine up in a pattern I can remember. For example, going from 1 to 6, it might be iPhone, iPad mini, iPad Pro, iMac, MacBook, Bluetooth dongle. Other chords are to get Command, Alt, Contrl - duplicated on both hands in mirror fashion. And chords for the number pad, locking edit mode, accessing macros and the function layers. Can seem confusing, but you start out with just the most common stuff and gradually add more to your repertoire. There are no buttons on the space blade. It senses if you are hitting the right or left corner or someplace in between. Have you looked at the videos at WayTools.com? It shows the first one when you go to the site (have to activate it though), but there are a whole bunch more at the bottom of the screen and it scrolls over for even more. And if you click on some items at the top of the page, there are even more! No remapping of chords, though you can do something similar. Suppose you want Command-A, but you don't want to use the command chord or hot corner. Well, a key isn't limited to programming just characters. You can include modifiers. Take the Home key on the layout. I could program that to be Command-A. Heck, I could program it to be command/alt/option/shift-A if I wanted! I do some of this on the emoji layer. Right now WT includes a command to copy the screen or a window to the clipboard, but not to the desktop. But I want it on the desktop. There is a key combination (I forget what it is now) which I entered into my customized setup to cover that. Hangie created some kind of system for his keyboard so he could set it up like a TextBlade before he got into Treg so you might ask him about doing that. Don't know if it works on latest OS. Thanks for all this info!!!! Could you maybe explain boundaries a bit more? I’m assuming this adjusts what surface area counts as hitting a specific key? How far can this be adjusted? There are 15 pairs of characters that you can adjust the boundaries for. Each has 5 settings. Middle is default and the others let you emphasize one or the other a little or a lot - though even a lot isn’t a big difference physically but it matters. Best to not mess with them at first - give yourself time to adjust. I’d notice what letters or combo of letters I was missing and, if they stayed a problem, I’d make an adjustment. Over time I’ve sometimes adjusted things back. There is a typing test website I like a lot because at the end it lists all the words you missed AND what you actually typed. I’d simply write those words down and practice typing those. Ok, @dabigkahuna - when you get a chance, email me all your stuff. I need the highest resolution originals you have. I’ll see about taking the lower resolution ones and either finding a good icon to replace them with or else make a new vector based icon so we can size it arbitrarily. I'll have to dig through my files first. I don't think hardly any are high resolution as is. And there is the problem of creating some uniformity of design in the long term, I guess. I'll try to get to it this evening. As I tell my friends: “You’ll get to it NOW, and you’ll LIKE IT!”.